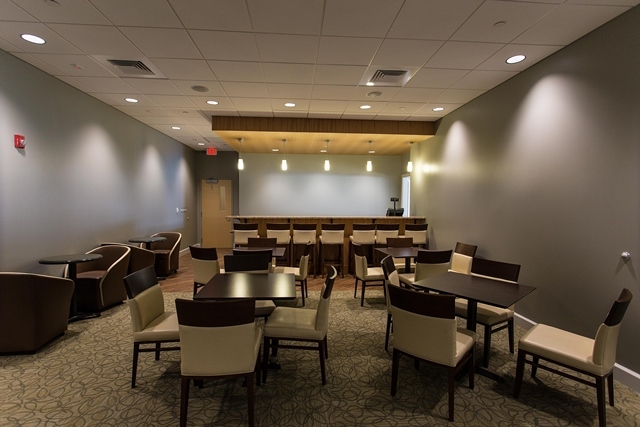 Johnson & Wales recently underwent a renovation to their Harborview Residence Hall located along the Narragansett Bay in Cranston, RI. The scope of the renovations to the assembly area included upgrades and alterations to the upper level function areas and lower level student dining areas, a complete revamp of the lower level kitchen to provide state-of-the-art food preparation and teaching facilities. The student living space, approx. 53,340SF of dormitory space, was renovated with concentration on the resident bathrooms and corridors. The front lobby area and office areas where also renovated. The university also took full advantage of the building’s proximity to the Narragansett Bay through the construction of an approximately 15,000SF exterior plaza.